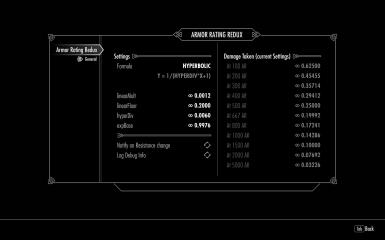 Fixes the ridiculously broken armor rating system in Skyrim by implementing a formula closer to what Morrowind had. Fully configurable! Armor Rating Redux - No Cap - Better Formula - Morrowind-like - Russian translation Требуется установка оригинального мода! Written by DaJay42, nexusmods.com, 2016. Software provided as-is, with no warranty. to respond within an month of a written request for such permission. Used under permission as stated on that mod's page. Player Only version no longer required, as calculations for NPCs are no longer a potential performance drain. Changes in armor rating always have immediate effect. No more ActorValue or AVI Skill Mult caused incompatibilities. High Damage Resist values no longer cause weird stamina consumption on blocking NPCs. NPC Damage Resist is no longer hard capped. On a different note, made the mod translation-friendly. Note that all included translation files are dummy files and contain English text. Added a German translation to serve as an example. Translators for other languages welcome! Fixed an issue that could cause the player to take excessive amounts of damage when exceeding vanilla resistance limits. Changed the used actor value from "Fame" to "Variable07". This should hopefully create less conflicts. Changed the way NPCs are treated. The new method has a hard cap at 99% resistance, and might be slightly slower to update, but should be a lot more reliable and cause less "spikes" in script activity. Added a "player only" version, for those who value performance over airness. A clean save is recommended when switching between "Everyone" and "Player Only" versions. Added advanced options: If activated, FloorExpHyp imposes a hard limit on your resistance in Hyperbolic or Exponential modes, equivalent to what linearFloor does in Linear mode. MultExpHyp, if enabled, reduces your resistance by a multiplier, and acts as a soft ceiling. Thanks Neker07 for the ideas! Fixed minor issue that caused incorrect debug output. The vanilla armor system is utterly, utterly broken. 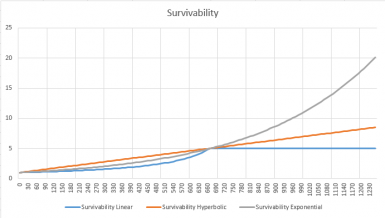 as your survivability increases hyperbolically. 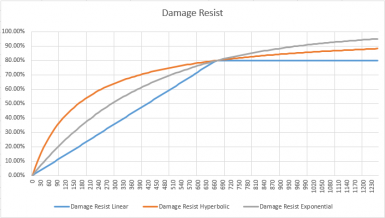 increase is pointless, as your damage resistance simply goes flat. This mod attempts to do just that. All changes apply to both the player and any NPCs. their current resistance: by notification or with a (fake) magic effect. modified by your skills, perks, etc. using armors with more than the standard amount of pieces. Damage Taken: The fraction of incoming damage that passes through your armor. 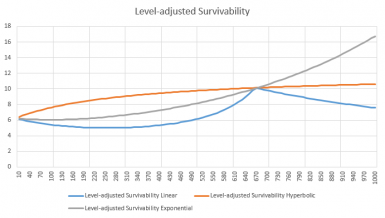 Survivability: By how much your armor increases your ability to survive damage. 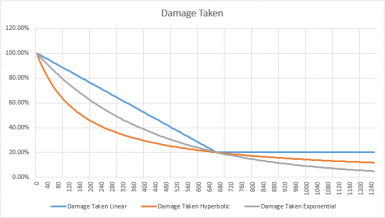 Your survivability will increase linearly, damage taken decrease hyperbolically. Twice the armor rating means twice the survivability. A compromise between Morrowind-style survivability and vanilla "balancing". Every point of armor will reduce damage taken by a fixed multiplier. armor will let you come closer to 100% resistance. armor rating, just like vanilla. exponentially. Every 'x' points of Armor Rating, your survivability doubles. Vanilla-like, but without the hidden armor rating. Just because. Every point of armor reduces damage taken by subtracting a fixed value. LinearMult controls the reduction per point. The default is 0.12%. 667 armor rating, just like vanilla. or Exponential modes, equivalent to what linearFloor does in Linear mode. modes by a multiplier, acting as a soft ceiling. Thanks Neker07 for the ideas! - Not compatible with any mod that attempts to do the same thing (duh). value. To know your precise resistance, use the "notify" option. longer a potential performance drain. - Changes in armor rating always have immediate effect. - No more ActorValue or AVI Skill Mult caused incompatibilities. - NPC Damage Resist is no longer hard capped. included translation files are dummy files and contain English text. damage when exceeding vanilla resistance limits. more reliable and cause less "spikes" in script activity. "Everyone" and "Player Only" versions. resistance by a multiplier, and acts as a soft ceiling. - Fixed minor issue that caused incorrect debug output. Written by DaJay42, nexusmods.com, 2016-2017.